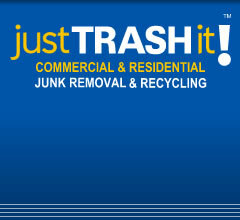 Atlanta,Marietta,Roswell,Dunwoody Junk Removal & Recycling | Just Trash It! I loved my experience with justTRASHit -they had great pricing and amazing workers who were very pleasant to work with! I've used Just Trash It! a few times. Kevin and his crews are courteous, on time, careful and efficient. It's a pleasure to do business with them. You get excellent services at a fair price. We had 3 storage rooms full of office junk. We wanted to keep some of it - so justTRASHit came in, took the broken or old items we asked them to - and left the rest, taking care nothing was harmed in the process. They even worked after hours for us! Just Trash It did a fantastic job for me. They were more than ready to get a pretty large, messy job done, and got it completely handled. Great service! Better prices than other companies too. Highly recommended - thanks!! Just Trash It is a KEEPER! Fantastic job! The personal and pleasant service was super! The representatives that came to do the work were timely, professional, and genuinely great at what they do! The word "Can't" does not exist in this company's vocabulary. Every worker was motivated, courteous and professional. They conducted themselves as if they owned the company. We're not a franchise & have been locally owned since 1997. Thanks for supporting local businesses! Book Online - get $10 off. Call for a FREE Estimate! Atlanta's top rated Junk Removal Company. Atlanta junk, trash, waste, garbage, rubbish & debris pickup & removal. We do it all! 770-399-6605- Call the leaders and experts. Got Junk? Let us haul away your old furniture, sofa, mattress, box springs, bed, dresser, desk, table, chairs, entertainment center, cabinets, appliances, refrigerator, washer, dryer, stove, dishwasher, water heater, ac unit, carpet, wet carpet, construction debris, lumber, wood, drywall, renovation debris, remodeling, yard debris, branches, electronics, stereo, computer, monitor, tv, recycling, scrap metal, filing cabinet, copiers, household garbage, hot tub, jacuzzi, piano, trampoline, office equipment, cubicles and more. We haul away from basements, garages, attics, offices, estate sales, office cleanouts, foreclosures, reo, evictions, storage spaces, restaurants and warehouses. We are the Atlanta Junk Removal specialists and can handle any valet trash, rubbish, debris, garbage, hauling or waste removal job. We are environmentally friendly & only dispose of waste at state-approved landfill sites/transfer stations & recycle whenever possible. Dunwoody owned & operated since 1997. Atlanta junk removal available for the following cities in GA (bold means we're doing LOTS of business in your area! ): Dunwoody, Sandy Springs, Marietta, Buckhead, Roswell, Alpharetta, Duluth, Buford, Norcross, Lilburn, Decatur, Smyrna, Tucker, Doraville, Chamblee, Lawrenceville, Vinings, Suwanee, Brookhaven, Peachtree, Clarkston, Stone Mountain, Woodstock, Kennesaw, Midtown, Virginia Highlands, Acworth, Snellville, Johns Creek, Cobb County, Dekalb County, Fulton County & Gwinnett County. Just TRASH It! makes every effort to recycle or donate up to 65% of the items we pickup, keeping them out of landfills.